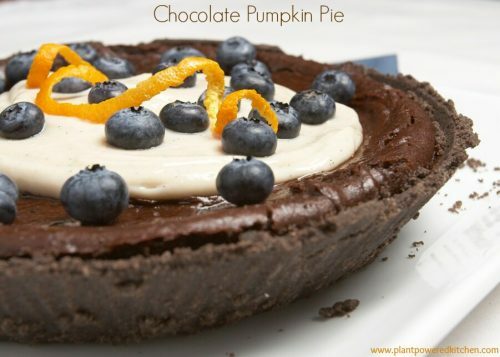 Chocolate Pumpkin Pie & Festive Chickpea Tart: Vegan Holiday Recipes to Impress! This Chocolate Pumpkin Pie is from one of my earlier books (eat, drink & be vegan) and is one of my all-time favorite recipes. Preheat oven to 425º F. Fit a metal or glass bowl over a saucepan on medium-low heat and filled with several inches of water (or use a double-boiler). Add 1¼ cups chocolate chips to bowl and stir occasionally as water simmers (not boils), letting chocolate melt. While chocolate is melting, in a food processor, add pumpkin pie mix (scraping out everything from can), sugar, arrowroot powder, and salt. Purée until very smooth, scraping down sides of bowl as needed. Once chocolate is melted, add to food processor and purée with pumpkin mixture, scraping down sides of bowl as needed. Pour mixture into pie crust (scraping out all filling) and tip pie back and forth gently to evenly distribute filling. Sprinkle on 2 tablespoon chocolate chips. Bake for 15 minutes, then reduce heat to 350 degrees F, and bake for another 35 minutes, until pie is set (the center may be soft, but it will set further as it cools). Carefully remove from oven and place on cooling rack. Let cool completely before slicing, refrigerating if desired.